No. 11/12 Virginia Tech (17-3, 6-2) will go on the road to take on No. 22/23 NC State (16-5, 4-4) on Saturday afternoon in Raleigh. This was going to be a difficult game for the Hokies even before Justin Robinson was injured against Miami. If he’s forced to miss Saturday’s game, getting a win against the Wolfpack will be even tougher. Robinson was injured in the second half of Virginia Tech’s 82-70 win over Miami on Wednesday night, and he was seen in a walking boot following the game. No information has been released regarding the extent of his injury, and fans are left wondering whether or not he’ll miss a significant amount of time. The Wolfpack were in each and every one of those games. However, at this stage NC State only has one Quadrant One win, a 78-71 victory over Auburn at home. They’ll be looking to add to their NCAA Tournament resume, and they’ll see a home against a Virginia Tech team that will potentially be without Justin Robinson as a great opportunity to pick up a Quadrant One victory. NC State is a well-rounded basketball team, as their numbers show. The Wolfpack have one of the best three-point defenses in the country, and they’ll hope that continues against the Hokies, who are one of the nation’s best shooting teams. They are also a very good offensive rebounding team, and though Tech has been very good on the defensive glass relative to their size (No. 5 in the ACC in conference games in opponents’ offensive rebounding), that’s still a matchup that could favor NC State. All the numbers point to this being an excellent matchup between two very good teams. Of course, if Justin Robison can’t play, or is limited, that may or may not be the case. G Markell Johnson (6-1, 175, Jr.): 11.9 ppg, 70 assists. Johnson leads the team in assists, and he’s 43.6% three-point shooter. G Braxton Beverly (6-0, 180, So. ): 9.6 ppg, 60 assists. Beverly has been starting since his freshman season in Raleigh. G CJ Bryce (6-5, 195, r-Jr.): 12.2 ppg, 5.0 rpg. Bryce is No. 2 on the team in scoring. He transferred to NC State from UNC-Wilmington, following head coach Kevin Keatts. G Torin Dorn (6-5, 210, r-Sr.): 14.2 ppg, 6.7 rpg. Dorn is NC State’s leading scorer. He began his career at Charlotte, but he transferred to NC State after one season. F Wyatt Walker (6-9, 240, r-Sr.): 5.8 ppg, 4.4 rpg. Walker will get the start on the inside, though he plays slightly under 20 minutes per game. From a size standpoint, that NC State starting lineup is smaller than Virginia Tech’s, though they bring 6-10 redshirt sophomore DJ Funderburk and 6-7 freshman Jericole Hellems off the bench. Expect to see plenty of Devon Daniels (6-5, 200, r-So.) as well. Daniels could be included in the starting lineup, depending on how Kevin Keatts wants to play. Nine NC State players played 12 minutes or more against UVA, and 10 players have appeared in 19 or more games this season, so the Wolfpack certainly have the depth advantage, particularly if Justin Robinson can’t play. If Robinson can’t play, there’s a good chance that Nickeil Alexander-Walker will play point guard and initiate the offense for Buzz Williams. That’s who Williams turned to after Robinson went down with his injury at Miami. The other question for Tech is the size of their rotation. The Hokies were only playing with a seven-man rotation before Robinson’s injury. 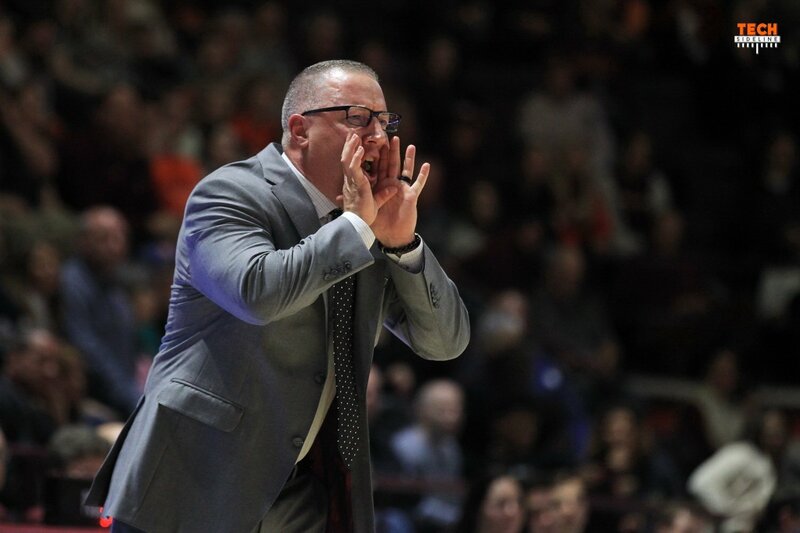 Will Buzz reduce that to a six-man rotation, or will the little-used freshman guard Jonathan Kabongo be pressed into action as Tech’s seventh-man? Kabongo has played in 10 games this year and played a total of 49 minutes of basketball. He has appeared in only two ACC games, and played a total of two minutes in those games. It’s not ideal for him to see his first major action on the road against a Top 25 team, but Williams likely has no other choice. If the Hokies can pull out a victory on the road against the Wolfpack, it will be their third Quadrant One victory of the season along with Purdue (No. 11) and Washington (No. 29). The Hokies currently rank No. 10 nationally in the NET, while NC State comes in at No. 25. Wonder when Horne is coming back? Kabongo should have played a few minutes in a lot more games. Wilkins could have also played a little more. All teams have at least a few minor injuries. I’m guessing Kabongo can’t redshirt, so play him a little when you can. Thanks Chris, let’s hope 5 will be OK. I believe this Saturday is the 2nd, not the 1st of February.